Long-time locals in Orofino, Idaho, like to boast that their town was built by natural resources, and for the most part, that's what keeps the economy going today. Steve Stajkowski owns SJX Jet Boats, in Orofino, Idaho, which has become an international player in the recreation business recently. Clearwater County, Idaho is timber country. But mills have been squeezed and shut down recently so communities have looked to diversify their economy. "You worked in the sawmill, you drove log truck, or you worked in the woods, logging, unless you wanted to drive to Lewiston there wasn't a whole lot for guys to do," he says. But in interviews with people like Borders across remote Idaho timber country in the last year, it's clear dramatic changes are afoot. Clearwater County voted overwhelmingly for Donald Trump, who campaigned that he'd be a champion for rural America again. In rural western counties like this that are heavily dependent on the booms and busts of natural resource economies, Trump's message of getting the miners back to mining and loggers back to logging resonated. But in the year since Trump took office, some in rural Idaho still feel a disconnect with Washington. In recent years, mechanization has eliminated timber jobs. Cheaper Canadian logs have flooded the market and there isn't as much federal land available for timber harvests. Two small sawmills near Orofino recently closed. "It's kind of a dying industry, in some sense," Borders says. So when the opportunity came along to get on as a welder at a newer manufacturing company in town, Jeff's dad urged him to take it. "He was happy to see that I got out of the woods," Borders says. "He spent his whole life working in the woods, and there's not much for retirement." After five years, Borders traded a saw for a welder where he works indoors at SJX Jet Boats. The company got its start building the nimble, fast moving shallow water boats that were ideal for sportsmen on the wide Clearwater River that runs through Orofino. But they've since expanded into selling boats to the military, law enforcement and other industries. Borders had to be retrained but it was pretty quick, and he likes the steady paycheck. Most loggers around here work as independent contractors and often get laid off for stretches of the winter. SJX Jet Boats is one of several businesses that Orofino attracted as the town has tried to diversify away from just timber and into what locals call recreation manufacturing: jet boats for Idaho's trout streams, rifles and scopes for elk hunting. SJX shares space with other newer companies in a building called the Orofino Business Park. The town built it with the help of a grant from the U.S. Economic Development Administration. "That has been full since construction, so it has complete occupancy and it's generating 40 jobs in the community," says Chris St. Germaine, director of Clearwater County's economic development office, a one person office. Forty jobs is a big deal in a town of 3,000 that lies within one of the poorest counties in Idaho. In fact, the business park is just one of many projects that local officials have gotten done by leveraging federal rural development aid. Others included grants to retrain laid off millworkers and USDA rural development loans that helped finance Orofino's new wastewater treatment plant. "These infrastructure projects, you're talking about $3, 5, 10 million projects, it's unattainable for communities without assistance," St. Germaine says. In a typical year, the USDA alone might spend up to $30 billion on projects in rural America, often according to St. Germaine, in relatively small "investments" that tend to have big returns in remote communities like hers. In 2016, Clearwater County voted 75 percent for Donald Trump, compared to just 18 percent for Hillary Clinton. The tallies were similar in surrounding counties that are also heavily dependent on timber. But despite supporting Trump, some in rural Idaho feel a disconnect with Washington today. The administration's preliminary budget released last year proposed a 20 percent overall cut to USDA, including deep cuts to some rural grant and loan programs. The "skinny budget" also proposed eliminating the agency that helped build the Orofino Business Park. "I think there's a gap in the understanding in Washington D.C. and policymakers of what rural needs really are, and what rural really is," St. Germaine says. In a speech to farmers in Georgia this month, the President talked about his push to increase rural broadband and promoted the recent tax cuts that he says will spur investment in rural America. This will likely resonate in Idaho timber country, where the federal government has long been viewed as overreaching, following years of fights over logging on public land. Despite the timber declines, you still see mills running, and lumber yards with big cranes stacking hundreds of ice-covered logs. Many rural people work long, hard hours and they talk proudly about supplying the wood that helps cities boom. Tom Vilsack, the former Democratic Iowa governor and USDA secretary under President Obama, says what's often lost in the conversation is that without the federal government, many isolated, rural communities couldn't exist today. A frustrated Vilsack left Washington last year feeling like the federal government – no matter who was in charge – couldn't communicate all the good it does in rural America. "It takes an understanding of how to speak about folks in rural areas, not speaking down to them, not saying I'm from the government I'm here to help," he says. Vilsack says federal agencies like his were largely absent from ribbon cuttings at businesses backed by federal loans or groundbreakings of local infrastructure projects. "Part of that announcement never points out the fact that the only way they're able to do this is because of federal government support," Vilsack says. This might help explain why the proposed budget cuts to rural aid programs aren't exactly at the forefront of a lot of people's minds in Clearwater County, Idaho, or at least not yet. Steve Stajkowski, the owner of SJX Jet Boats, got a federal grant recently that helped pay his way to one of the largest boat shows in the world in Germany. He credits it for a big boon in his overseas exports since. "These grants were giving us the opportunity to reach well beyond the streets and mountains of Idaho," Stajkowski says, as he surveys his busy factory floor. Stajkowski says the budget cuts could affect some people but benefit others. "Well, when one door shuts, another one opens," he says. This week, President Trump renewed a campaign promise saying he will be a champion for rural America. But his budget proposal last year floated steep cuts to many federal rural economic development programs. 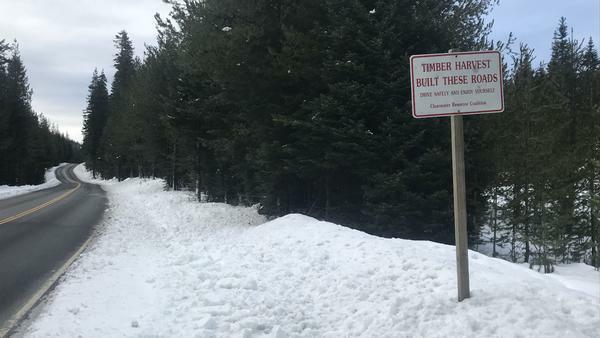 NPR's Kirk Siegler has been visiting a remote corner of Idaho timber country where federal dollars have been used to diversify the economy. KIRK SIEGLER, BYLINE: Logging will always be in Jeff Borders' blood. JEFF BORDERS: One of the things I love to hear is the trucks, you know? 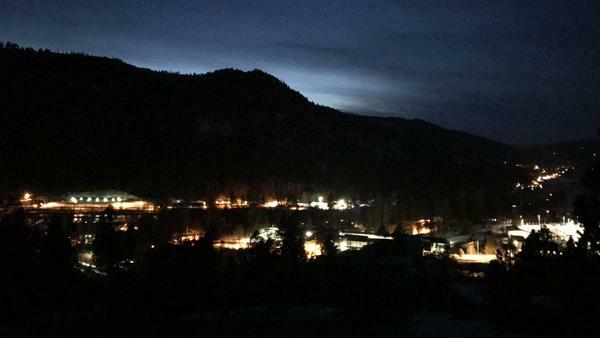 SIEGLER: He grins with pride watching the rigs rumble down the mountain into the river-cut canyon here onto Highway 12. Next stop - the mills down in Lewiston. BORDERS: I started getting into it when I was just out of high school - so 18. Dad got me in on the company that he was working for, hooking logs. SIEGLER: His dad, his grandpa - everyone around here worked in the woods. It's what you did. BORDERS: Growing up, when I got out of school, it was - you worked in the sawmill. You drove log truck, or you worked in the woods, you know, logging unless you wanted to drive to Lewiston or find something else to really do. There wasn't a whole lot for guys to do. SIEGLER: I've met a lot of guys like Jeff Borders here over the last year who've told me there's been a lot of changes in the industry, though. Mechanization has eliminated jobs. Cheaper Canadian logs flooded the market. Two mom and pop saw mills near Orofino, Jeff's hometown, recently closed. SIEGLER: So when the opportunity came along to get on as a welder at a newer manufacturing company in town, Jeff's dad urged him to take it. BORDERS: He was happy to see that I got out of the woods, though. You know, he spent his whole life working in the woods. And you know, there's not much for retirement. You really got to make your own retirement. SIEGLER: Jeff Borders builds jet boats. That's his welding you hear. These are the boats that go really fast, skimming over shallow water, perfect for the wide Clearwater River here. He had to be retrained, he says, but it was pretty quick, and he likes the more steady paycheck. 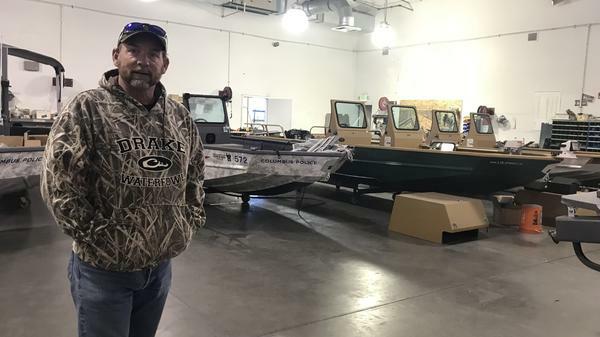 SIEGLER: SJX Jet Boats is one of several businesses that Orofino attracted as the town has tried to diversify away from just timber and into what locals call recreation manufacturing - jet boats for Idaho's trout streams, rifles and scopes for elk hunting. SJX shares space with other newer companies in a building called the Orofino Business Park. The town built it with the help of a grant from the U.S. Economic Development Administration. CHRIS ST GERMAINE: And that has been full since construction. So it has complete occupancy, and it's generating 40 jobs in the community. SIEGLER: And that's a big deal in a town of 3,000 that's in one of the poorest counties in Idaho. Chris St. Germaine runs the county's one-person economic development office. They've leveraged a lot of federal rural development aid lately - money to retrain laid-off mill workers - USDA Rural Development grants that helped finance a wastewater treatment plant. ST GERMAINE: When these infrastructure projects - you're talking about $3, $5 $10 million projects. It's unattainable for communities without assistance. And these aren't all grant programs, either. They're loan and grant programs. SIEGLER: Most years, the USDA spends some $30 billion on rural development. In President Trump's preliminary budget last year, he proposed a 20 percent cut to the agency. The administration also wants to cut some rural grant and loan programs and eliminate the agency that helped build the Orofino Business Park. ST GERMAINE: I think there's a gap in the understanding in Washington, D.C., and policymakers of what rural needs really are. SIEGLER: In remarks this week aimed mostly at farmers, the president talked about his push to expand rural broadband and promoted the tax cuts that he says will spur investment in rural America. This kind of talk resonates in the Idaho mountains where there's a long history of fights with the federal government over logging on public land. Clearwater County voted 75 percent for Trump. And despite the timber declines, you still see mills running and lumber yards with big cranes stacking hundreds of ice-covered logs. SIEGLER: People work long, hard hours, and they talk proudly about supplying the wood that helps cities boom. But Tom Vilsack, the former Democratic Iowa governor and agriculture secretary, says the federal government plays a huge role in making this happen. TOM VILSACK: It takes an understanding of how to speak about folks in rural areas, not speaking down to them, not saying, I'm from the government; I'm here to help. SIEGLER: A frustrated Vilsack left Washington last year feeling like the federal government, no matter who's in charge, couldn't communicate all the good it does in rural America. At SJX Jet Boats, the extremely busy owner, Steve Stajkowski, says he got federal grant money to go to a big boat show in Germany, which he credits for a boon in his overseas exports. STEVE STAJKOWSKI: These grants were, you know, giving us the opportunity to reach well beyond the streets and mountains of Idaho. SIEGLER: But the talk of proposed cuts from Washington aren't really being followed that closely here. Stajkowski mostly shrugs them off. STAJKOWSKI: The budget cuts - yeah, I mean, they're going to affect some but benefit in other directions, I'm sure. SIEGLER: As he sees it, when one door shuts, another one tends to open. Kirk Siegler, NPR News, Orofino, Idaho. Transcript provided by NPR, Copyright NPR.